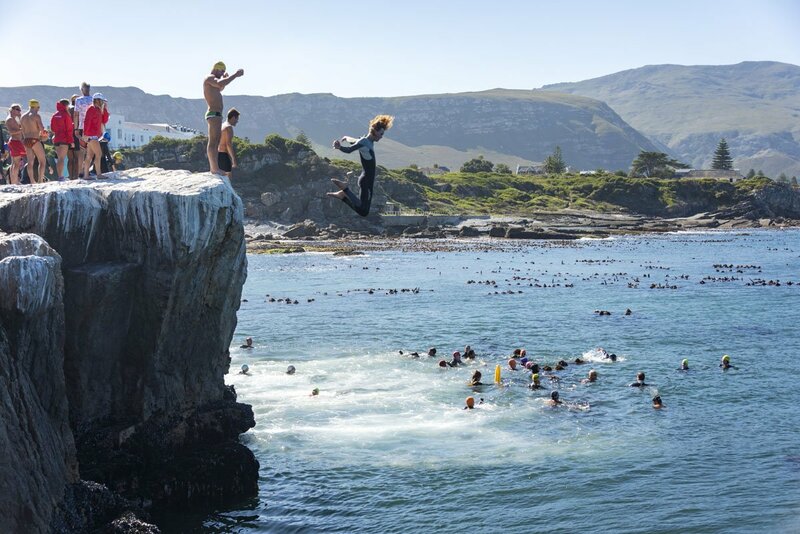 Walker Bay Xtreme Hermanus - Swim, Run, Jump! Walker Bay Xtreme – Swim, Run, Jump! 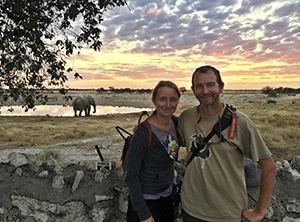 Our first post from South Africa! 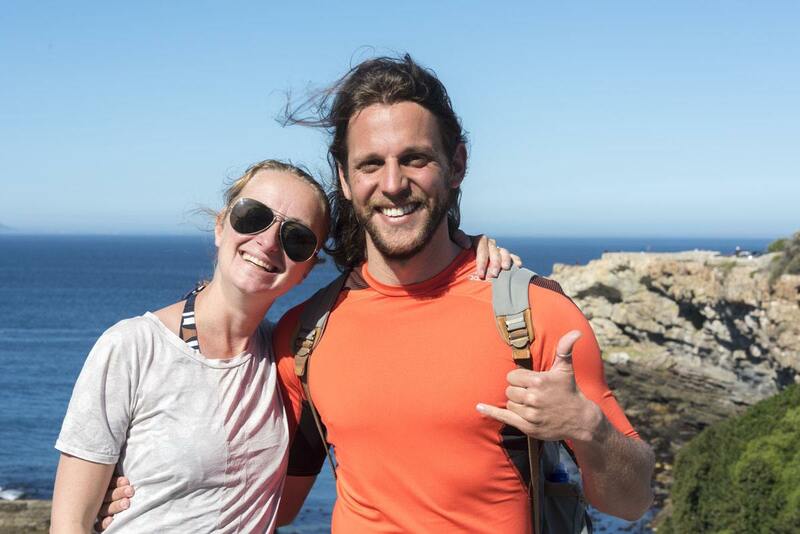 Less than a week after our arrival in the country, I did something totally crazy – I took part in the Walker Bay Xtreme event in Hermanus, together with our friend Nick Montemaggi! 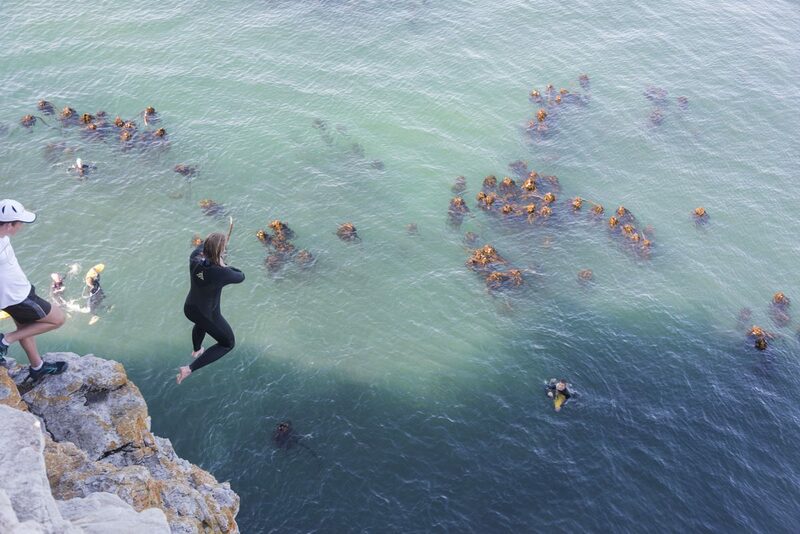 From swimming in the icy cold Atlantic Ocean to jumping from a 10 meter cliff, here’s what we got up to! I couldn’t look beyond the tip of my toes. I was standing on a white-grey cliff – the Atlantic Ocean was 10 meters below me. Don’t look down, we were warned, during the official race briefing. Don’t look down, or you’ll never jump. Just do it, take a step, lean forward… and jump. I couldn’t. I just couldn’t. My hands were wet and clammy. My legs were shaking. Soon enough, my whole body was shaking. People were jumping all around me, while the lifeguard in the water below was shouting something in Afrikaans. That’s when I did what I shouldn’t have done – I looked down. The ocean was a pale turquoise, with the tops of kelp plants bobbing between the waves, looking like the gateway to strange worlds inhabited by angry merpeople. The water splashed one the barnacle-topped rocks, coming and going in an endless dance. I retreated, turned back, looked for a way to climb to the top of the Dreunkrans cliff. 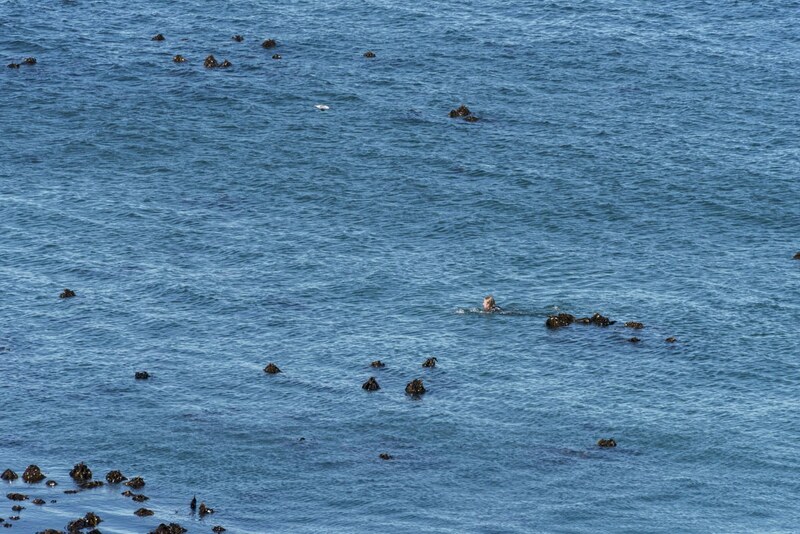 I would quit the race and walk back to Hermanus, barefoot, in my wetsuit. But there was no way to walk back up. And I’m not a quitter. Now or never, I thought – and I leapt off the cliff. 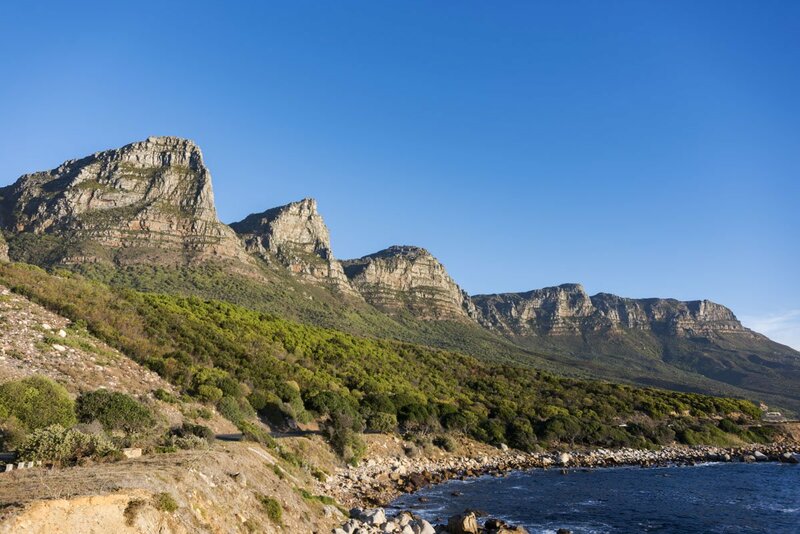 What is the Walker Bay Xtreme all about? The Walker Bay Xtreme is one of those events that sound cool when you first hear about it – then you realize what you have signed up for, and a mixture of dread and anxiety kicks in. 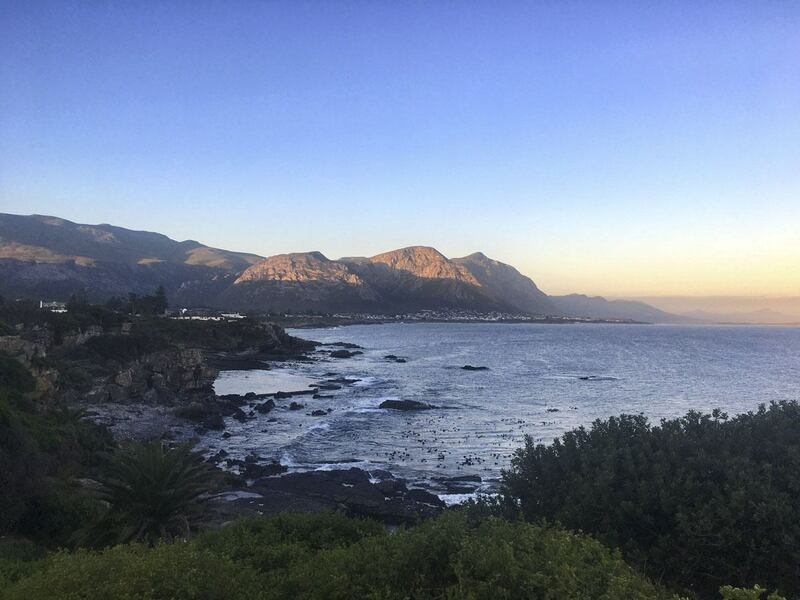 It’s a three-day adventure/extreme sport festival, taking place in Hermanus, a spectacular coastal town about an hour away from Cape Town, famous for being one of the few places in the world where you can watch whales from the shore. 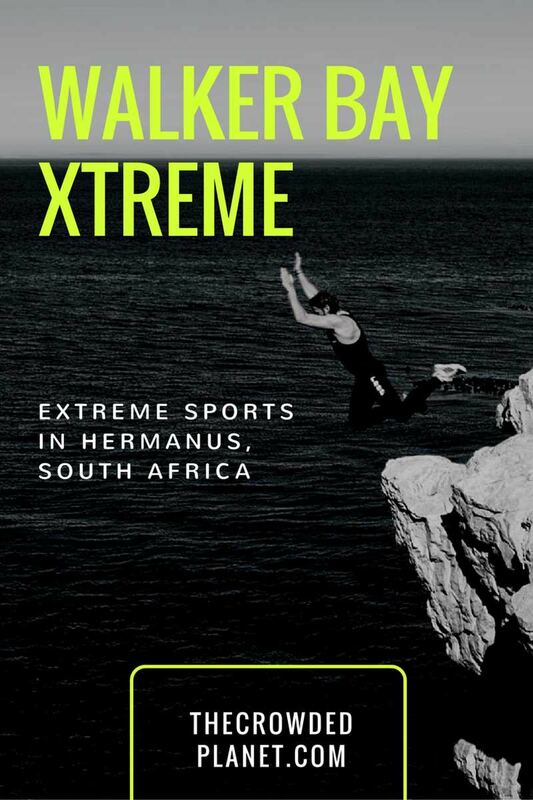 This year, the Walker Bay Xtreme took place between April 29th and May 1st. Over the course of the three days, there were a triathlon, a SUP race, a trail marathon, and even a paragliding competition. 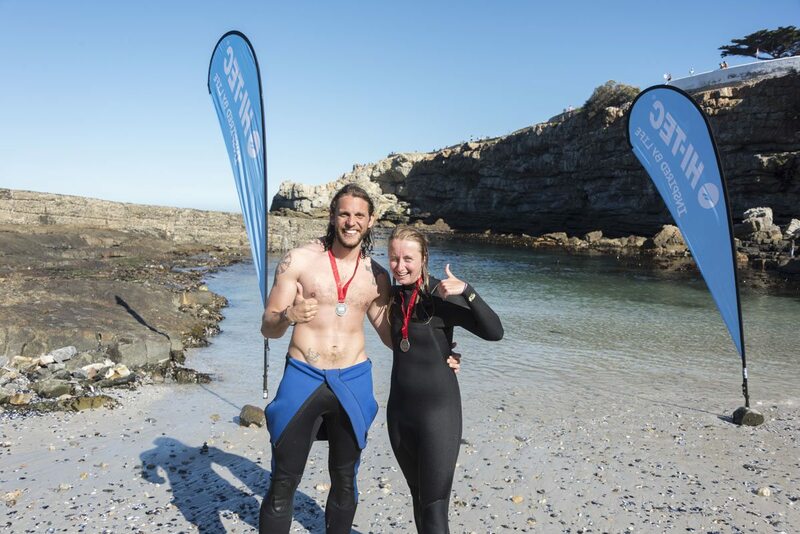 My friend Nick and I had chosen to join the last event – the ‘Sea and Sand Xtreme’, including a 400m swim, 1.5km run, the famous Dreunkrans 15 meter cliff jump, another 400m swim followed by a 1km run, and a final 500m swim. That means 2.5 km running – I can do that, I thought – plus 1.3 km swimming, and a 10 or 15-meter cliff jump. I am a terrible swimmer, and cliff jumping terrifies me. Yet, I had agreed to take part in the competition. Don’t ask me why. After the briefing, I jumped into the ocean, waiting for the race to start. The water was absolutely freezing. It felt as if tiny blades were stabbing every single exposed inch of my skin. The temperature that day was around 9°, and despite my wetsuit, soon I was shaking in the water. My hands and feet lost sensitivity – and when the horn was blown and the race began, I was feeling dazed, freezing and terrified at the same time, and stood (actually, floated) in horror as every single contestant sped past me. 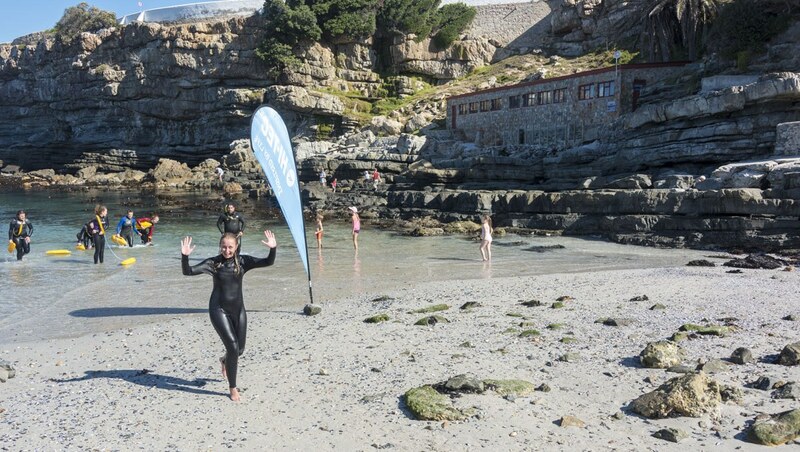 I ended the first swim dead last, covering the 400 m distance in a kind of electrocuted doggy paddle – and raced uphill from Hermanus’s tiny harbour, hoping that running, the only activity I am actually half-decent at, would allow me to make up some time. Trust me, running with a sodden wetsuit and shoes is not quite the same as running in the city on a nice spring morning. 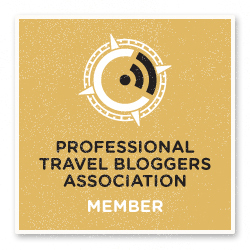 But yes, I did pass a bunch of people – until we got to Dreunkrans. 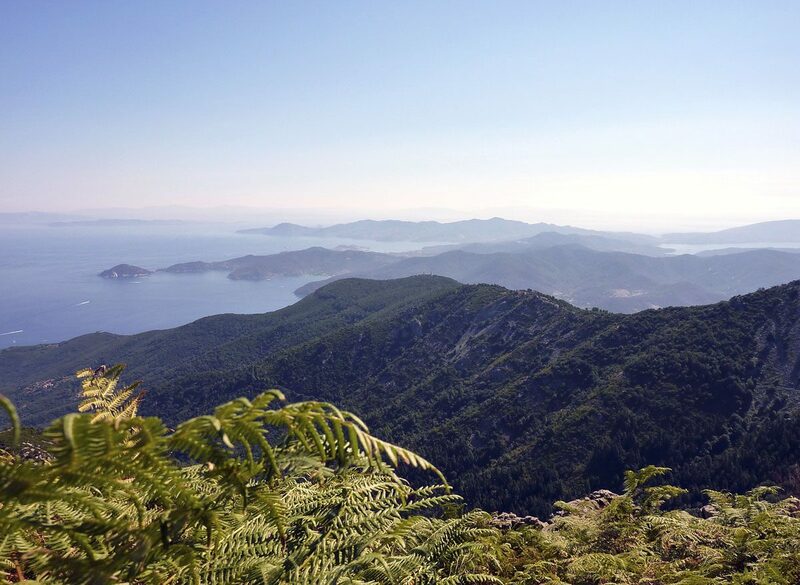 There was no way I would do the full 15 meter jump so I opted to climb down a bit, and jump from the so-called ‘Ladies Bench’ – still, a more than respectable 10 meters above the ocean. Here’s the proof I did jump! 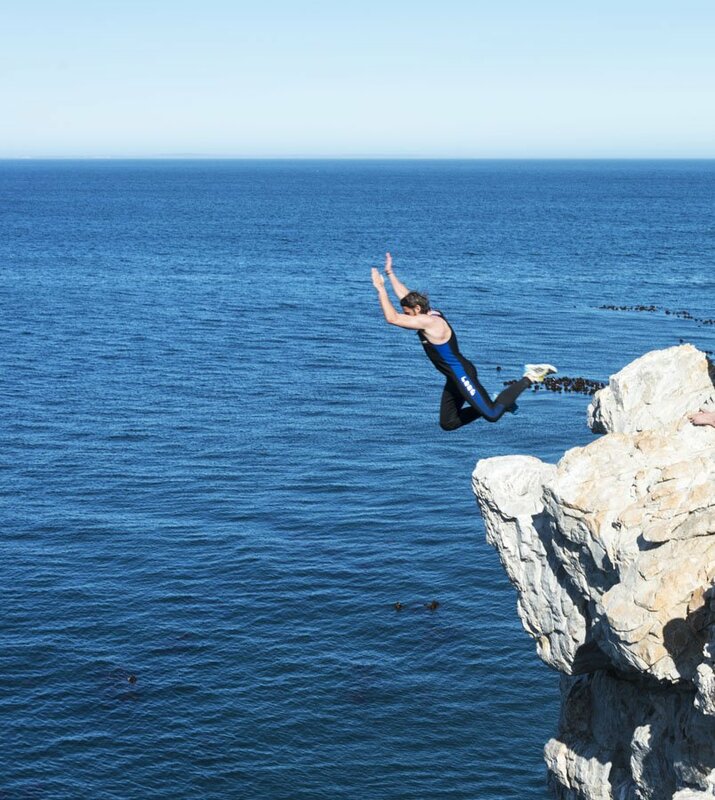 After taking that terrifying leap – perhaps the scariest thing I’ve done alongside the Biella bungee jump I did last year – I found myself, once again, in the ocean, with a considerable distance to cover. Swimming in the open ocean is a whole different experience compared to swimming in a pool. I had no goggles, and the ocean water was too salty for me to swim with my head down – I tried, and I was streaming with tears. Keeping my head above water was part of the exercise, with waves rolling in every few seconds. However, maybe because I was feeling proud with myself after having jumped, or maybe because the grey-turquoise scenery of cliffs and sea had lifted my spirits, halfway through the race I started to enjoy myself. I wasn’t even feeling cold anymore. Adrenaline was pumping through my body, giving me the energy I needed to complete the second swim, throw myself out of the sea and over some rocks, run another kilometer, jump into the ocean again and swim to the finishing line. I completed the Sea & Sand Xtreme in 52.30 – very pleased of the fact that I beat two guys! My friend Nick was 10 minutes faster than me (he is half Viking after all), and the winner of the race took just over 20 minutes! My experience at Walker Bay Xtreme left me with various aches and pains, a sore toe after having stepped on a sea urchin and a massive sense of self accomplishment. It was one of those ‘if I can do this, I can do anything’ kind of moments. Next time I feel unsure of myself, I will be looking back at the moment I leapt off the cliff, feeling like a (terrified) superhero. There’s so much talk about breaking out of one’s comfort zone, wandering into the unknown and whatnot, that I feel the need to share with you what got me through those harrowing 52 minutes of the Walker Bay Xtreme. It was determination. I guess you can also call it stubbornness – with a pinch of craziness thrown in. At the end, with our medals! The Whale Coast Hotel was the ideal place to rest after the crazy race. 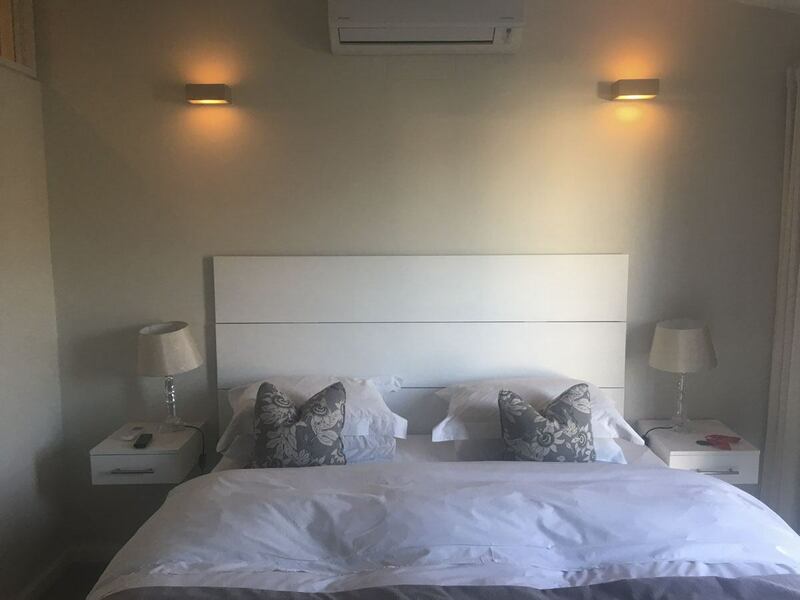 The three of us stayed in a lovely luxury apartment, in a super convenient location not even 10 minutes walk from the center of Hermanus. The hotel is adjacent to a shopping centre and next door to a supermarket and liquor shop – perfect if you’re self catering! Our apartment slept four, with two separate bathrooms and a spacious living room where we all collapsed after the race. The decor was bright and modern, with lots of white fabric and big windows. The kitchen was fully equipped – but needless to say, none of us could be bothered cooking! Breakfast was also excellent, including a continental buffet and some cooked options – we had an omelette, a full English breakfast and French toast with bacon rashers, and everything was really tasty. Many thanks to Mariette Du Toit-Helmbold from Destinate, Hank from Walker Bay Xtreme and the management of the Whale Coast Hotel for having welcomed us in Hermanus!